Study finds an archaic hominin had modern dental growth. OHIO STATE UNIVERSITY, COLUMBUS, Ohio – A relative of modern humans that lived at least 104,000 years ago in northern China showed evidence of dental growth and development very similar to that of people today, a new study found. An international team of scientists performed the first systematic assessment of dental growth and development in an East Asian archaic hominin fossil that is known as the Xujiayao juvenile. The fossil is of a 6 1/2-year-old who lived between 104,000 and 248,000 years ago found at the Xujiayao site in northern China. The researchers were surprised to find that in most ways, this child’s dental development was very similar to what you would find in a child today, said Debbie Guatelli-Steinberg, co-author of the study and professor of anthropology at The Ohio State University. “The Xujiayao juvenile is the oldest fossil found in east Asia that has dental development comparable to modern humans,” Guatelli-Steinberg said. The study was published today (1-16-19) in the journal Science Advances. Teeth provide some of the best data anthropologists have about the growth and development of our ancient ancestors, she said. That’s because growth lines in teeth retain a record of dental development. Compared to our primate cousins, modern humans – including their teeth – take a long time to form and develop. Anthropologists believe this characteristic is associated with humans’ longer periods of child dependency – how long a juvenile relies on support from a caregiver. Among other techniques, the researchers used synchrotron X-ray imaging to look inside the fossil to see the internal structure of the teeth, including growth lines that revealed the rate of tooth development. Using the growth lines in the teeth, the researchers estimated the death of the Xujiayao juvenile at about 6 1/2 years of age, said study co-author Mackie O’Hara, a graduate student in anthropology at Ohio State. The first molar of this juvenile – what we call the 6-year-molar today – had erupted a few months before death and had started to wear a bit. The root was about three-quarters complete, similar to humans today. “We found that this juvenile was growing up – at least dentally – according to a schedule similar to that of modern people,” O’Hara said. Another aspect that was similar to modern humans was the perikymata, which are the incremental growth lines that appear on the surface of the tooth. “We found that the way these perikymata were distributed on the Xujiayao juvenile teeth was close to what we see in modern humans, and not to Neanderthals,” Guatelli-Steinberg said. The one aspect of dental development in the Xujiayao juvenile that was not modern was the rate of growth in the roots of the teeth. Here, the juvenile showed relatively fast growth, compared to a slower growth in modern humans. 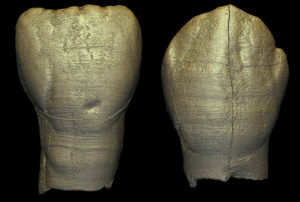 While the dental development of this juvenile suggested it had a slow life course similar to modern humans, Guatelli-Steinberg cautioned that we don’t know what happens in later childhood in hominins like this one. “It would be interesting to see if dental development in later childhood, such as the growth and development of third molars, was also similar to modern humans,” she said.